Julia Wilbur became an acquaintance, then an ally, and finally a lifelong friend with Harriet Jacobs, author of Incidents in the Life of a Slave Girl. Harriet came to Alexandria in January 1863, about two months after Julia did. Together, they accomplished more than probably either could have done on her own. 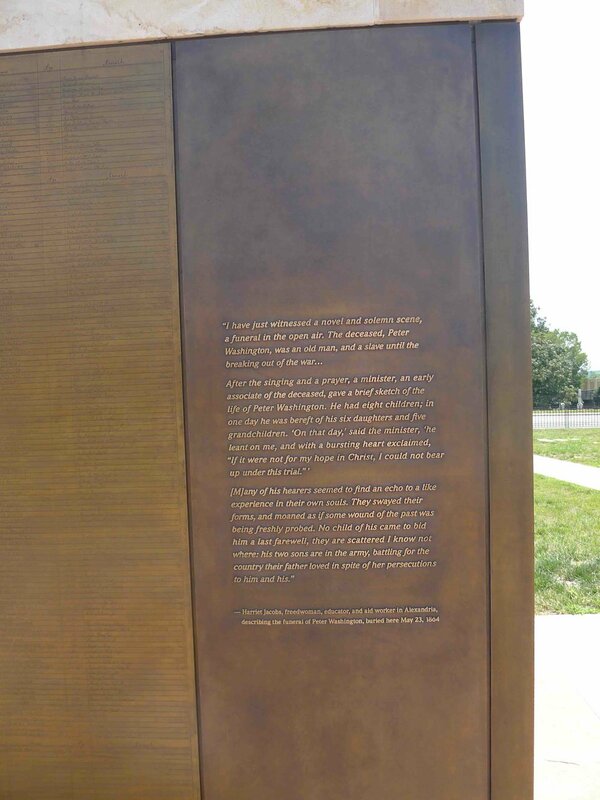 A quote from an 1864 Jacobs letter, now in bronze at the Freedmen and Contraband Cemetery Memorial in Alexandria. Harriet Jacobs was born, enslaved, in Edenton, North Carolina in 1813. She recounted the story of her girlhood and her brave escape from slavery in the book Incidents in the Life of a Slave Girl, published in 1861. The book, one of the few slave narratives written by a woman, is now widely available, including online. The names and a few details have been hidden, but historian Jean Fagan Yellin verified the essential elements about 20 years ago. Jacobs spent most of the years after her escape in New York State and Massachusetts, with an eye-opening trip to England in the 1840s. She reunited with the daughter and son, also finally freed, as well as with her brother. After publication of her book, William Lloyd Garrison, publisher of the Abolitionist, asked her to write an article on the condition of freedmen in Washington. This trip made her realize the role she could play in working with freedmen escaping slavery and entering Washington and Alexandria; the New York Friends sponsored her return to Alexandria in January 1863. Julia Wilbur and Harriet Jacobs had briefly met in Rochester in the late 1840s. With a similar mission in Alexandria, they became allies, then friends, in Alexandria. Two civilian women--one black, one white--took on the white military establishment, sometimes succeeding and sometimes not. They remained friends for the rest of their lives and died within a year of each other, in Washington, in the mid-1890s.